The average price for this game in the past 6 months is $21.49. The game first became 50% off on Nov 24, 2016 at Best Buy. Lowest historic price was $15 on Nov 23, 2017 at Target. New low by a few bucks on Skyrim Special Edition on PS4. Bigger maps, remastered art, and more...still a great game years later. October released The Elder Scrolls V: Skyrim Special Edition is well over 50% off now at Best Buy for the PS4 and Xbox One with a drop to $25. Black Friday low price spotted on Thanksgiving Thursday. Dell Home has brought back its $25 Gift Card bonus on Skyrim Special Edition for the PS4 and Xbox One. A bonus 40% the size of the game. Not bad. Thanks to Dealzon user Jezzuz01 for pointing out it's back. The average price for this game in the past 6 months is $17.98. The game first became 50% off on Nov 24, 2016 at Best Buy. Lowest historic price was $14.99 on Mar 28, 2019 at Walmart. New historic low price on Skyrim Special Edition from Xbox Live's giant Black Friday sale (almost everything on the damn platform is on sale). At $20, you can buy Skyrim YET AGAIN. That's how saving money works, right? Best time ever to jump on The Elder Scrolls V: Skyrim Special Edition for the Xbox One with a drop to $25. Cheapest ever by $3 and $35 off the usual $60. Xbox One only coupon deal going on at NewEgg on Elder Scrolls V: Skyrim Special Edition. Almost ties the lowest price by a penny. For whatever reason, no similar coupon for the PS4 version. The average price for this game in the past 6 months is $20.04. The game first became 50% off on Mar 1, 2019 at Green Man Gaming. Lowest historic price was $19.68 on Mar 1, 2019 at Green Man Gaming. The average price for this game in the past 6 months is $6.30. The game first became 50% off on Apr 23, 2013 at GameFly. Lowest historic price was $3.60 on Mar 22, 2016 at Green Man Gaming. Classic Morrowind on the cheap. Today GOG dropped the price to $3.74. Only $0.14 off its historic low. Morrowind GOTY only $3.60 today in GMG's Spring Sale. New low by $0.30 from an authorized retailer. The average price for this game in the past 6 months is $8.40. The game first became 50% off on Apr 23, 2013 at GameFly. Lowest historic price was $5 on Dec 24, 2013 at Green Man Gaming. There's the Oblivion GOTY for $15 and then there's the Oblivion GOTY Deluxe for $20. What's the difference? They both contain the Oblivion game with Knights of the Nine and Shivering Islands, but the Deluxe also includes the other DLCs: Fighter's Stronghold Expansion, Spell Tome Treasures, Vile Lair, Mehrune's Razor and more. It's $10 off at GOG. The average price for this game in the past 6 months is $27.75. The game first became 50% off on Nov 21, 2018 at Green Man Gaming. Lowest historic price was $24.60 on Mar 1, 2019 at Green Man Gaming. New historic low price on Skyrim VR from GMG during their giant 500+ titles Birthday Sale. For those that have already bought Skyrim, Skyrim Special Edition, and all other versions of Skyrim on other platforms - why not get the "final" version on VR? Steam key for 44% off. If you have a VR setup and you've somehow never played Skyrim - well, the VR version of Skyrim will be releasing tomorrow on Steam. GMG's sitewide 20% off coupon is still running and happily this title qualifies. 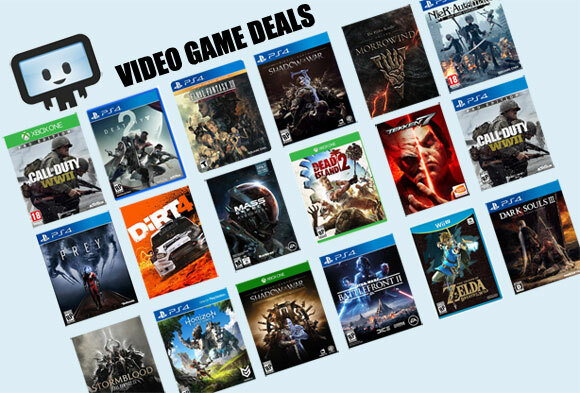 Next best price is $50.99 at Fanatical or DLGamer at 15% off.